[Roleplay] SSMB Heroes Academy: Protect The Multiverse! "Boomsticks! Greetings, future hero! We need your help!" "The SSMB Multiverse, an anomaly in the Fictional Realm. A group of interconnected worlds consisting of heroes and villains of many shapes and sizes, and thanks to the deeds of one girl and one Hedgehog not from this web of worlds but from different multiverses entirely, threat after threat began to emerge. With villain activity at an all time high, we need more than a small band of heroes to take them down! So I, Buzz, head of security and secret ninja commando operations for Skylander Academy, have issued a distress call across the multiverse for heroes! It doesn't matter if you're big or small, we need you! Now let me introduce you to The Academy!" "Thanks to the Future Foundation, a multiversal protection organization, I have personally opened a new branch of the Skylanders Academy right here in the town of Forest Crossing! Here, you will train and be dispatched for missions across the multiverse. Now, let's go over the registration process!" - Each writer can have up to 7 Main Characters who can leave the Academy to go on adventures! However, only 5 can leave at a time. The other 2 must stay behind. - Paragraphed based dialogue. Nothing script based unless if you have sprites for the character. - Each character is allowed a maximum of two elements. As the name implies, Brawler Class Skylanders specialize in melee fighting. You don't wanna get in the way of their flying fists! Not just limited to Skylanders who specialize in Magic, Sorcerer Class Skylanders use their natural abilities or even special weapons to perform various actions, making them the most versatile of all Skylanders! Heavy hitter Skylanders need heavy hitter weapons! Smashers use their large weapons for close range destruction! Not the strongest in damage, but the best at range, Bowslinger Skylanders aim to please with their bows and arrows! Knight Class Skylanders use their single sword to slash their enemies with powerful swings! For those who shoot first and ask questions later, Quickshot Skylanders dual wield guns for rapid-fire justice! Sentinel Class Skylanders wield long staff-like weapons to attack enemies from great distances. Enemies better beware if their weapons have blades on both ends, a preference among Sentinels! Masters of stealth, Ninja Skylanders are acrobatic and love their shurikens or other projectiles! You'll never see them coming! For those who love things to go BOOM! Bazooker Skylanders wield large guns for mass destruction from a distance! Can you outrun their wrath? Swashbucklers dual wield their swords that, despite not being as strong as a Knight's sword, can attack with agility and grace. Villains are advised not to go near them, unless you wanna be sliced up into tiny bite-sized pieces! SEASON 2 ADDITION: SKYLANDER CLASSES! Giant - Strong and absurdly large, Giants are a force to be reckoned with! SuperCharger - A master at driving, diving or flying. These Skylanders are at their best when behind the wheel! Sensei - A master of their Battle Class. They trained in their respective arts year after year until they are full blown experts! "Class is in session, future Skylanders! I recruited two of the best Disciples we have to lead the charge against these menaces! Especially since they seem to not get enough of this place..."
An ancient hedgehog who lost almost his entire race to one of his kind (Mephiles) many years ago, Sonic and his family spent millions of years fighting Mephiles. Soon, he was drafted into the Disciples as a founding member to fight Mephiles and the Metarex once more. Sonic is a born leader, but doesn't mind having fun and acting more like a teenger when it's time to kick back. Like Sayaka, Sonic has a strong sense of justice and can be reckless. He can also be over-protective due to losing so many. Little does Sonic know, is that he is actually a fan-character, which is typically looked down upon by many Real Worlders. Sonic is also a mentor to Sayaka Miki. Sonic possesses the Sentinel Sword, which belonged to his father, who was the General of the Sentinels. The sword allows him to access the powers of fire, water and electricity. "Wait, so you're not sticking around, Buzz?" Sonic asks, confused at the sudden announcement. Buzz shakes his head. "Sorry, Sonic. I have other Golden Skylanders to train! The Fictional Realm's protectors aren't gonna teach themselves! Besides, you two hang around here all the time, so it's not like this is gonna change anything!" Before Sayaka could say anything else, Buzz disappears through a Portal. Sayaka sighs. "Well, time to get to work, then!" Participation in certain events that take place in the RP will result in a new badge for your profile! My name is Igor, and this is my assistant, Margaret. Welcome, guest. You see, we are contacting you from a land known as the Fictional Realm. A place where the imagination of you, the Writers who live in Reality, manifest into living beings. Indeed. The Fictional Realm is a land of endless multiverses. Where we reside, is a specific multiverse. This is where the events that happen in this very "Roleplay" take place. Here, many worlds used to revolve around a place we called: The Hub, a converging point where people from other universes meet. There, we were visited by a group of unusual individuals who call themselves... The Disciples. They come from a land separate from our realms known as the Golden Skylands. The Disciples are an elite team of Skylanders formed from fictional characters from all over to protect you, the Writers from any harm that threatens to break through into your reality. They also visit other universes in their war against the Metarex, a team of evil fictional characters hellbent on destroying you and ruining all the realms. Led by Sayaka Miki and an ancient creature who goes by the name of "Sonic The Hedgehog", the Disciples and the friends they met along the way have encountered many threats here. From the Daleks, to the Liberators, the deadly Link Jokers and the League of Super Evil (LOSE). The threats kept coming, that the decision was made to create an Academy for Skylanders in training to combat these foes. With the Hub now destroyed and the Skylanders now taking refuge on an abandoned island called Club Penguin, their operation to recruit new heroes to fight the forces of evil continue. And this is where you come in, to dispatch heroes of your own to join the cause... correct? - Each writer can have up to 9 Main Characters who can leave the Academy to go on adventures! However, only 5 can leave at a time. The other 2 must stay behind. - Paragraphed based dialogue. Nothing script based! ...Now then, with introductions out of the way, I wish you luck. The fate of the multiverse rests on your hands. Biography: Rocku is a young rock cavy who dreams to become a pro martial artist, he LOVES fighting more than anyone and it's his passion to fight strong opponents to prove his worthiness, which is why he and his brother Graff (who he dragged along) came from their world to enroll in the Academy. Biography: Graff is Rocku's one year older brother who is more simple minded, laid back and generally lazy compared to his more focused, hardworking younger bro, it's quite ironic how Rocku is more mature than him. Despite that, he causally enjoys martial arts as well but of course not as much as Rocku and even then, he much prefer a simple day in the couch with a can of pop. This community seems nice, so I think it'll be fun if this is my first RP thread! Tell me if I screw up anything in the registration. Sanae Kochiya is a science savy, outsider who resides in the world of Gensokyo. Strangely adabtable, she greatly enjoys youkai extermination and finds great entertainment in solving incidents. A carefree, fun loving, albeit over the top and somewhat silly girl. She is a living god, and has the ability to create miracles and manipulate strong, constant gusts of winds alongside summoning her gods at will. Her sense of justice is odd, but good. Well this is the Blaze we know (and love). She's hardworking, strong and has a very strong sense of duty and justice. She is tense and increadibly independent, however she does appreciate and open up to her friends. While she appears cool and analytical, she is very easy to anger and can become very rash when tensed up. Overall, a very trustworthy ally, given that you can gain her confidence and trust. Sayaka observes the new recruits, who are lining up at the Academy's entrance. "We got a good batch of new Skylanders so far!" Sonic nods. "Yeah, I think we should probably open the Academy up! Buzz still left the ribbon in front of the entrance." He walks towards the ribbon. "Wait, you forgot the scissors! You need them to cut the ribbon during ceremonies, right?" Sayaka yells, holding up a large pair of scissors. Sonic chuckles. "Who needs the scissors?" He unleashes his Sentinel Sword as it unleashes fiery flames and burns the ribbon into ash. "I'm all about the spectacle." "What, where is this? Did my ritual go wrong? ", Sanae span around in shock, trying to absorb any possible information on her surroundings. All she saw was a few other people, and a few more game characters. Before she could react, the feline, beside her groaned "Ugh, what was that... Where am I?" and sat up from the ground. Sanae, after whimsicly observing her surroundings, decided that she must have accidently transcended into another dimension. She turned around cheerfully to Blaze and said "Perhaps it wasn't such a great move to use a random ritual as an attack. Blaze, wake up, it looks like we flew off into another dimension during our fight". Blaze immediately perked up and stared at Sanae with hostility, but backed down, secretly figuring out that it must have been her error in improperly using the Sol Emeralds during their querral. Sanae, noticing her previous hostility, calmly told her "Have you calmed down now? Don't worry I'm not going to do anything bad, I'm a shrine maiden after all!". Blaze looked up to her and decided that, for now, she should try to trust her a little bit and got up and stuck out her hand "I'm Blaze the Cat, the guardian of the Sol Emeralds and protector of Mobius". Sanae replied in kind, with much excitement, "I'm Kochiya Sanae, a living god and shrine maiden from Gensokyo". Now, they turned their heads to see what the ceremony was all about, resolved to discover more about where they are. "Skylanders Academy is now open!" Sonic declares, twirling his sword around in excitement. "Now, follow me so I can introduce you to the mission briefing room!" "Umm Rock, you wanna remind me why we're here in some world we don't know about with a bunch of weirdos?" whispered Graff. Rocku glanced at him with a rather bored look and answered his question dryly, "Clearly cause before our destination, the unknown message was sent to us in needs of assistance to prove our potential...oh yeah and maybe stop the threats too." "And that concerns us because?..." Graff simply asked. "Because WE'RE THE CHOSEN ONES!" Rocku yelled rather excitedly. "Well, I can see Sonic's excited." A voice can be heard from behind Sayaka. Sayaka looks behind her. "Tails! You're here." "Of course I am. Why wouldn't I be?" Tails responds. One of Sonic's brothers, Tails was born with the attribute of having two tails. He had a strong command over the power of wind, but was rather inexperienced with his powers. All that changed when Mephiles destroyed almost the entire race of Magical animals, leaving Sonic's line of brothers and sisters to be the only survivors. Tails managed to get his hands on a gear which belonged to the Tech King of his race, causing his abilities to change. Tails sacrificed most of his magic abilities for an incredible intellegence and even the ability to create things most people deemed "impossible." Tails embraced his exchanged abilities over the years and made many inventions. His favorite creations being the Metal Sonic army. Tails later became a Disciple and worked closely with many tech wizards in the fictional realm, like Tony Stark and Drobot. 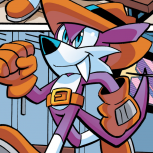 Despite having lots of his Magic potential stripped away from him, Tails won't pull any punches in a fight. His two tails can be used to fly if his Magic Reserve and rocket boosters run out and can also be utilized to blow enemies away. Tails is also armed with a versatile wrench which doubles as an electric whip and other useful gadgets. Tails is always willing to lend a hand and looks up to Sonic as a leader. Tails won't hold back when objecting to something Sonic brings up that he doesn't agree with though. Tails can get carried away in terms of talking about things he knows about and can be seen tinkering with objects in his spare time. He feels a little outcasted though, seeing all his allies have lots of magical power yet he doesn't have a lot anymore. Because of this, Tails sometimes underestimates how valuable he is to his team since he spends most of his time behind the scenes. Despite all this, he is proud of his smarts. As the recruits continuing following Sonic, Sayaka and Tails to the mission briefing room, Rocku decided to speak up. "Um excuse me.....Sonic is it? Is there anything going on in this world that made us come here?" "Yeah. We sent out a distress call to all worlds in this multiverse. Villains from all over have been popping up more and more often ever since me and Sayaka visited this world a year ago. " Sonic explains, pointing at a chart on screen, showing a bar graph. "As you can see, over the past year, threats to our worlds continued to rise. We have had many close calls, and I can't risk having more. We need more help and fast!" "Goddamn... First a drag queen slaps me around and now I'm late for this? How can this day get any worst?" Personality: Ragna the Bloodedge is a wanted criminal known as the Grim Reaper from the BlazBlue universe. He can be brash but despite his appearance and temperament, he actually means well. He's currently looking for his sister Saya and has a bad relationship with his brother Jin Kisaragi, due to the latter betraying him and being insane thanks to his sword (its a long story). Ragna wields the powerful Blood-Scythe which appears as a sword but opens up to become an actual scythe for when he really needs it. He also has the Azure Grimoire, a powerful source of magic that powers up Ragna in a pinch. Finally his Drive is Soul Eater which let's him absorb some of the enemy's health. Here Ragna enlists in the Skylander Academy to protect the weak while looking for Saya. Suddenly a school girl runs in with toast in her mouth. "Sorry that I'm late... Ehehehehe...."
Personality: Komaru Naegi is a newer agent of the Future Foundation. She was a normal schoolgirl until everything went to hell. Trapped by her captors for a year Komaru made the best out of her living until a Monokuma attacks her and Byakuya gives her the best weapon the Future Foundation has; The Hacking Gun. With it Komaru can defeat the various Monokumas with it and it has its own unique powers of its own that she can switch from. Komaru can be childish, gullible, and even cowardly but she grows into a more confident person who never gives up, much like her brother Makoto. Suddenly the monitors in the room become static-y and a familiar face. "Upupupupu! Look at all you losers! While you've been happily sitting around, doing your homework I have been spreading despair everywhere! Its a beautiful despair! I doubt you'll be able to fix anything because you're all losers! Have fun knowing that despair always wins!" With a final laugh Monokuma buzzed off the monitors, leaving everyone in silence. "Oh, such my luck on being at another academy with another strange premise" The person said with a sign "But oh well, let make this interesting, shall we?" Bio: Komadea is a bit of a strange case. He's known as the Ultimate Lucky Student due to, you can probably guess, his crazy amount of luck. This luck is more of a curse than a useful trait, though. It can either be extremely good luck or extremely bad luck. If something good happened to him (ex winning a lottery), something bad is usually to follow after (ex someone stole his lottery card). Personality wise, Komaeda comes off as a kind and optimistic young man. He often encourages other to be hopeful and cooperate with everyone. Unfortunately, his social skills need some work as he often lack tact and say things that may seem weird or unsettling and continue on as if it's a casual thing to say. Komaeda rather avoid conflict and get along with people. Finally, Komaeda have a strong yet twisted ideal of Hope and tried his best to get everyone to believe in it, even if it means he have to do some questionable things to reach to that point. Komaeda enters the mission briefing room, looking mildly exhausted. "Apologizes... for the lateness" Said Nagito, in between pants "Some giant bird was rampaging around the school building (for some reason) and um, how come everyone is so quiet?" he asked as he notice how quiet everyone is in the room. Graff somehow found the strange bear to be rather adorable, "Awww, it's kinda cute, half evil sure but still cute!" Rocku just stared at him confused. "What the heck was that thing?" He asked. Sanae and Blaze continued moving on with the class in silence. The volume of people and the pace of the development continued to confuse them. Blaze had recognised Sonic, however she couldn't reach out to him in all the mayhem. Finally, Sanae spoke up "What do you mean you gathered us here to help you?! What about our own dimensions! And who was that bear?". Blaze began to try to piece everything back together. She was in her own dimension a while ago, until she suddenly met Sanae in her mansion and than got wisked away to this strange academy. She then realised she didn't have the Sol Emeralds and realized how bad the situation had gotten. "oh no oh no, god no! What can I do, I need to go find the Sol Emeralds!" she thought. But she was trapped, among all the people, and the blasted bears. Her immediate thought of action was to destroy her surroundings, but how could she do that without harming anyone? So she shouted "I have to go and find something important, let me leave this instant!" In panic. "Monokuma..." Sayaka says, pointing at the screen. "We've dealt with him before. He's a part of an evil organization trying to take us down." Suddenly, the screen began to glow green as a face appeared. "Finally! I managed to gain control again! Anyway, what did I miss?" Biography: Alter-Ego, originally was an AI made by a programmer named Chihiro Fujisaki to assist in cracking down on the secret of Monokuma's plans in Danganronpa: Trigger Happy Havoc. This Alter-Ego, still designed after his programmer is now the virtual Academy overseer. He was programmed by Chihiro, Tails and Cyrus Borg to combat a virtual terrorist group known as the Liberators. Due to this, his combat capabilities in the virtual realm allow him to shoot down enemies with ease like some sort of anti-virus software. "Ah nothin, just a half-cute half-creepy bear dude blabbing something about 'DESSPAAAIR!!!!'. So what's up with you, talking lady on a green television thingy?" "I'm a guy, actually." Alter-Ego says. "My father's a crossdresser." "Anyway, I'm the program who helps maintain this Academy, provide you all with mission details, commands the Metal Sonics and that sort of thing." Sonic, noticing Blaze's breakdown runs over and puts his hand on her shoulder. "Hey! Hey! Calm down, we'll make sure the Sol Emeralds will be safe. Okay?" "What, you expect me to say something else?" Sanae was calm, betraying her previous excitement and cheerfulness with Blaze. She saw that Blaze knew someone and felt slightly envious, but quickly brushed off those feelings. Blaze, calming down, decided to put the issue to rest. She could find them, and with Sonic and Sanae she felt more confidence. There were still many things she desired to know, but she decided to leave it for now. The next question was natural for both of them as stern heroes, and they both asked it at the same time, "what do you want us to do?". "As long as you don't try to deliberately try to kill us like what you did during the Link Joker crisis, I guess I'll agree with you." Sayaka says to Nagito. Tails nudges Sayaka. "I don't think this is the same Nagito as the one from the Link Joker crisis." Meanwhile, Sonic looks at Blaze. "What matters right now is getting to know each other and train with your new Elemental and Battle Class abilities. We can't fight anyone if we aren't prepared." Rocku was already getting excited knowing they already had an opponent on their hands as he ask punching his fists together. "Alright! Since Teddy Boy is a threat of ours, I gotta ask: What exactly are we up against?" "Isn't that the guy who's obsessed with hope?" Komaru thought to herself, "I shouldn't even make eye contact with him." "Alright guys! Let's get to training! We're no good if we can't fight back!" Alter-Ego thinks to himself. "Enemies from all over the multiverse. Such as-" A large thud can be heard from outside, causing the room to shake. "Such as whatever just landed!" "So much for training! Let's go!" Sonic yells. Rocku already left the room getting ready to train leaving everyone but Graff confused. "So thissssss is the Sssskylander Academy? Well, not for long will it sssstay sssstanding!" A mysterious cloaked figure says to himself, floating out of a Monokuma shaped rocket. "I've been paid good money to take this ssschool down, so might as well do it quick!"